Stir the cheese, parsley and bacon in a medium bowl. Spoon about 2 teaspoons cheese mixture down the center of each shrimp. 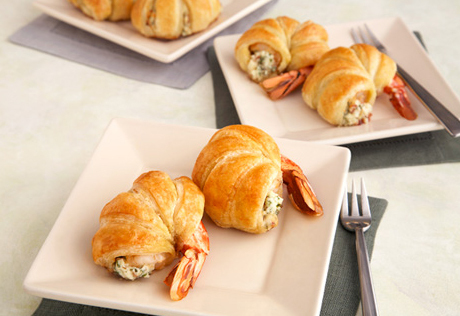 Fold the sides of the shrimp over the filling. Unfold the pastry sheet on a lightly floured surface. Cut the pastry sheet crosswise into 18 (1/2-inch wide) strips. Starting at the top, wind 1 pastry strip around 1 shrimp, slightly overlapping the pastry and ending just before the tail. Repeat with the remaining pastry strips and shrimp. Place the pastries onto a baking sheet.